Would you believe that I've never tried Butter Pecan ice cream? seriously, I don't think I have, or if i have, it was once and a very long time ago. It's just one of those flavors that can get my attention. 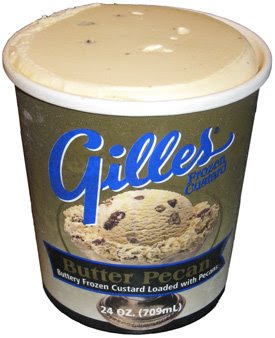 Well, leave it to the Ice Cream Club to finally get me to try it by including Gilles Butter Pecan Frozen Custard. Opening up the container, you are greeted by the aroma of fresh pecans. I can't say custard looks terribly different than "regular" ice cream. So, after having tried it, I know my gut was right: There's no need to order butter pecan on a menu, there are just too many other exciting flavors to try. Don't get me wrong, this is a quality product, I'm just not excited by the flavor. I didn't really notice much of a butter taste, instead, it's all about the pecans. They're a nice quality, and there's a decent amount of them, but overall I would say that they're a bit too salty. As much as I love salty snacks, I don't want to taste salt when I'm done with one, and I do a little bit here. Now that I think about it, I can't think of any flavors that use salted nuts. So kudos for trying to be a bit different...as long as that is what your customers want. Before I leave, I should talk about the whole frozen custard versus ice cream debate. Frozen custard uses a custard (egg) base and you think the difference would be night and day, but I was too distracted by the pecans to notice. I'll have to go back for another go around and see what's up. On Second Scoop: I just can't get over the salty taste of this ice cream. Granted, I don't love pecans, so that isn't helping. Even if you don't scoop a pecan, the base still tastes like salty pecans. Actually, maybe that's just how pecans taste or something. Oh well, this is obviously a quality product and I'd love to try one of their other flavors. I recommend this one for pecan lovers only.